Here’s how Self Classifier Account different from Admin Account? Welcome to OCLAVI (Object Classification and Annotation for Computer Vision Models). The one-stop solution for all your label and object annotations. The other day one of our clients had a question about OCLAVI login page. We offer 3 kinds of accounts for users. The doubt which he had was about the difference between all three accounts Self Classifier, Team Classifier and Admin. Self Classifier account is a user who does object annotation by themselves. It is limited to one user access. Once you log in with this account you will be able to use OCLAVI annotation tools as per pricing plans of your choice. Example: Eva is a model developer for a reputed company looking for Object annotation solution approached OCLAVI. She registered herself with Self Classifier account. Now she can use the account for object annotations. Admin Account is a solution to this problem. 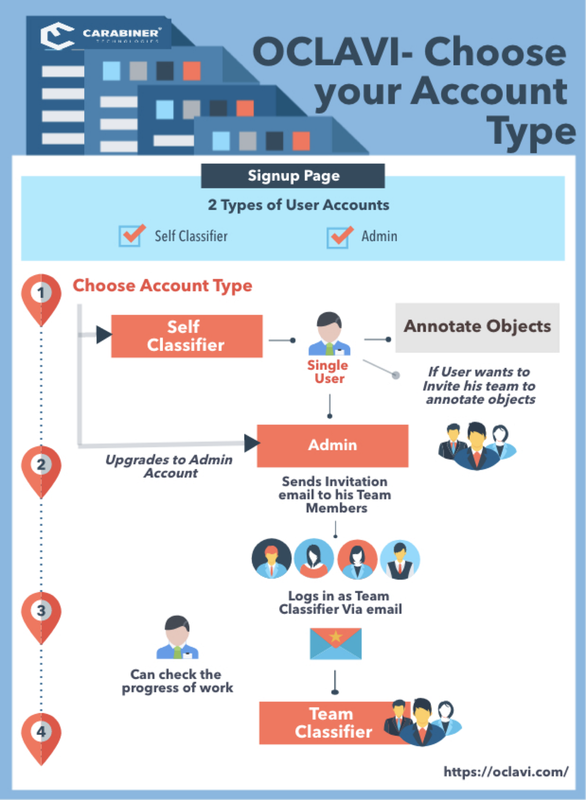 As a self classifier if you want to bring in your team to annotate, all you have to do is upgrade yourself with Admin account. The benefit with admin account is you can invite your team members to annotate on behalf of you. Example: Eva now upgraded herself as Admin user and started inviting her team. Isn’t that simple. As Admin in the previous step you have invited your team members to annotate. The Invitee will receive a verification mail through which he will login and annotate images on behalf of you. As admin, you have access to watch your team members progress. Example: Eva invited her team and they receive a verification mail. By clicking on the verification link, they will be able to login OCLAVI Team classifier account. Eva has access to check the progress of Team members while they annotate objects. Isn’t this a cool option for you to get registered?